Plastic Roll Top Cover - Cal-Mil Plastic Products Inc. 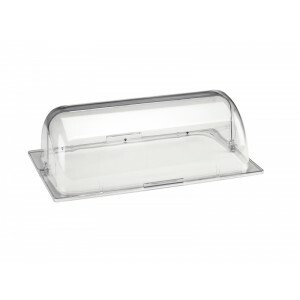 Attractive, clear plastic covers can be placed on a tray to protect products from contamination. Convenient roll top design, employees and customers can easily access the products of their choice without having to remove the entire cover. Chafer covers are not warranted for steam table use. NOTE: Chafer covers not warranted for steam table use. CAUTION: Handle can get extremely hot. Do not expose to direct flame.